Cactus Flower Florists: Don't Forget Nana and Pop! Grandparents Day is Sunday, September 10th! Don't Forget Nana and Pop! Grandparents Day is Sunday, September 10th! Some of you may be thinking, "Oh, good grief, not another 'Hallmark Holiday'" (term used by those who are certain greeting card manufacturers make up holidays just to sell greeting cards. Since there are seven BILLION greeting cards sold annually in the US alone, the card companies really don't need to make up fake holidays!) However, Grandparents Day is nothing new. In fact, it has been a legally recognized holiday in the US since 1978. In a calendar full of special recognition days, Grandparents Day stands out as one that is severely under-celebrated. I mean, it's Grandma! And Grandpa! Surely they deserve a bit of pomp and circumstance. After all, there's a National Cheese Doodle Day (May 5th), a Garfield The Cat Day (June 19th) and International Yada Yada Yada Day (July 23rd, for those lovers of Seinfeld). Two days we can all really get behind fall in November--the 2nd is Men Make Dinner Day and the 4th is Use Your Common Sense Day. And what about December 6th, National Read A Book Day, which is followed on the 7th by National Buy A Book Day. If the creators of the last two days had utilized the Common Sense Day, they'd know that perhaps they should BUY the book first, then READ it. However--GRANDPARENTS DAY--what a wonderful reason to celebrate. Whether you are fortunate enough to still have both grandparents, or you want recognize that special person who has shouldered the grandparent job alone, this is a perfect way to make a fuss over people who generally prefer to fuss over others. *If you are miles apart, CALL THEM! But before you reach out, write a list to refer back to. Make note of the reasons your grandparents mean so much to you. Perhaps Grandma always made you a new dress for the first day of school. Maybe Grandpa taught you how to fish. Were they your regular after-school caregivers? Did they offer up their home to your family during times of transition? Or did they become your parents when your own were not able? Let them know. Tell them now, while they are still around to hear this and be blessed by it. * Give your time. Offer to do yardwork, painting, little chores around the house. Drive them to doctor appointments, on shopping excursions, to their favorite restaurant for lunch. As people age, it gets harder to do the things they used to take for granted. However, older folks are generally prideful of their independence and simply will not ask for help, no matter how much they need it. Grandparents Day gives you a reason to help without making your loved ones feel as if they are a bother. * Take them somewhere they wouldn't normally go...to a museum, the zoo, the Botanical Garden, to see a concert, to visit any one of the many cultural goings-on in metro Phoenix on any given weekend. This gives them a chance to get dressed up, get out of the house and see something new. Not to mention, they'll be enjoying your company while doing so. * Just talk. We're all in such a hurry, with our kids and our jobs and spouses and busy, busy lives that sometimes, we lose sight of the things that should be most important. Just listen to the stories the older generations have to tell. You'll be glad you did. * And of course, send them something to let them know you are thinking of them. How often do your grandparents get a gift 'just because'? 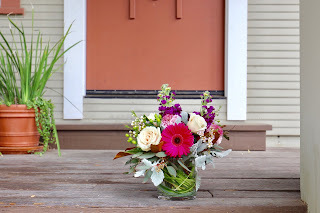 It's exciting for them to hear that knock on the door and open it to see someone standing there, holding flowers or a nice green plant or a fresh basket of fruit! Check out our website for great ideas for Grandparents Day gifts! Our friends at Generations United invite you to #DoSomethingGrand in honor of #GrandparentsDay (Sept. 10). They’ve put together a host of ways you can get involved. Find out how at www.grandparentsday.org.